Hinrichs: "One of the big questions that manufacturers are trying to answer right now is whether growth can be sustained both in the U.S. and in China as these two key markets begin to look more alike." CHICAGO -- In his most strongly worded statement on trade issues to date, Joe Hinrichs, president of Ford's Americas unit, took Japan and specifically Toyota to task for benefiting unfairly from currency manipulation. In a speech before The Economic Club of Chicago, Hinrichs said Ford would "urge Congress to oppose a TPP [Trans-Pacific Partnership] if it does not include strong currency disciplines." "When Toyota came out and said half their profits are due to currency change of the yen, that's a big deal. They said that," Hinrichs said Thursday in comments to reporters after the speech. "When [Toyota President] Akio [Toyoda] came out in support of [Japanese Prime Minister Shinzo] Abe saying we need a weaker currency, that's a corporate policy statement." "Toyota and [Renault Nissan Chairman Carlos] Ghosn said we need a weaker currency and the currency got weaker," said Hinrichs, who has been taking on an increasingly vocal role as Ford's point man on trade issues. "Morgan Stanley estimated that the recent fall in the yen puts roughly $2,000 per export vehicle into the pockets of Japan's three biggest automakers." Japan denies manipulating its rates. "Of course every country has a right to conduct sound monetary policy," Hinrichs said. "That includes legitimate strategies like quantitative easing. But direct currency intervention cannot be tolerated in the 21st Century." Toyota booked a foreign exchange gain of 260 billion yen ($2.47 billion) in the fiscal third quarter. The yen lost about 23 percent of its value against the dollar over the past year, Toyota announced on Tuesday, Feb. 4. Toyota has estimated that its operating profit increases 35 billion yen for every yen the currency loses against the value of the dollar. Toyota has said its corporate strategy is to localize production to ease the risk of currency swings, rather than try to take advantage of them. The company says 70 percent of the light vehicles it sells in the United States are now made in North America, including most of the Toyota brand's best-selling models -- with the exception of the Prius hybrid. Lexus models are mostly still imported from Japan, but Toyota announced last year that it will invest $360 million to move production of the Lexus ES sedan to its plant in Georgetown, Kentucky, in 2015. And Bob Carter, senior vice president of automotive operations at Toyota Motor Sales U.S.A., said Thursday that Toyota doesn't depend on currency fluctuations to make a profit. "We don't run our business on currency," Carter told reporters after a presentation at the Chicago auto show and before Hinrichs' public remarks. In 2013, Toyota exported a record 130,000 U.S.-built vehicles abroad, a 5 percent increase from 2012, Carter announced Thursday. "We think the sound of 'Toyota Imported from North America' has a nice ring to it … so we'll continue expanding our exports this year," Carter said in a speech here. Hinrichs' comments come as the United States and 11 Pacific Rim nations seek to complete work on the Trans-Pacific Partnership agreement over the next few months. And Ford will oppose the Trans-Pacific Partnership if the trade agreement doesn't limit a country's ability to manipulate its currency, Hinrichs stressed. The proposed pact "is not likely to generate any net benefits for American manufacturers if it does not address the critical issue of currency manipulation," he said. In direct response to Hinrichs' claims, a Toyota spokesperson on Thursday referred to comments made last summer by the U.S. government's top central banker. Japan is "not manipulating their exchange rate, they are not directly trying to set their exchange rate at a given level," then-Fed Chairman Ben Bernanke told a House Financial Services Committee in July 2013. "What they are doing is engaging in strong domestic monetary policy measures, trying to break the deflation they've had for about 15 years, and a side effect of that is that the yen has weakened." Hinrichs also pointed out that the Japanese auto industry has not gone through the same restructuring the U.S. auto industry underwent in the last five years. That means there's still excess capacity and that capacity has to go somewhere, he said. Those extra vehicles likely won't go to China because of poor relations between Japan and China, and they won't go to Europe because of ongoing economic weakness there, he said. "So where's it going to go?" Hinrichs said. "We believe markets should be open." He said Ford supports a proposal put forward by the American Automotive Policy Council that would require direct ramifications for countries that intervene in their currencies by tinkering with their foreign exchange rates. And he is optimistic that the auto industry's long-held concern about possible currency manipulation is being heard by Congress, which would have to approve any agreement. "What's different this time is a majority of the House and 60 senators have signed a letter to the president saying strong currency language needs to be in a trade agreement or Congress will not approve it," Hinrichs said. "If a country intervenes, there should be a mechanism for dealing with that." He said it's critical to set up a strong template for trade agreements in order to keep markets open. "If you set a template for a trade agreement with Asia, there's a concern because eventually we're going to have exports from China. The government is very much involved in the RMB [Chinese renminbi] to the dollar," said Hinrichs, who spent three years in China as president of Ford's Asia Pacific Africa region. Hinrichs said strong trade partnerships are also needed to maintain the company's U.S. exports that have grown 50 percent since 2009, when auto industry sales reached a 27-year low. 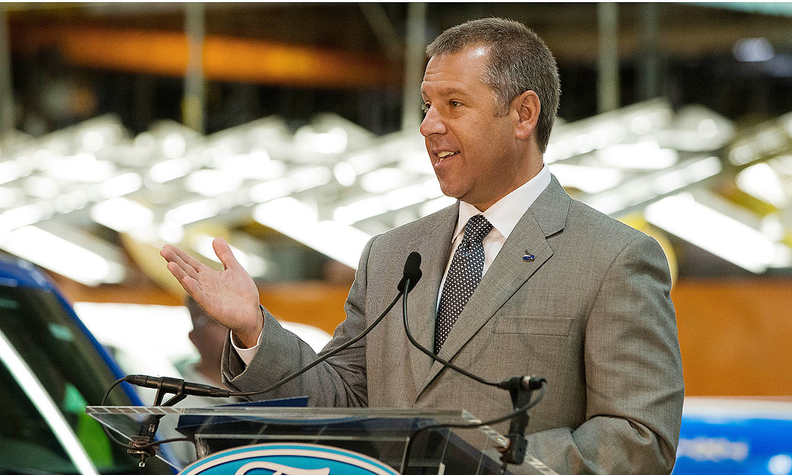 Ford, the second-biggest U.S. automaker, is the nation's largest exporter of vehicles, Hinrichs said. While Ford shipped more than 370,000 vehicles out of the United States last year, and more than 30,000 Edge and Explorer SUVs produced in North America were sold to customers in China, automakers will have to adapt as the gaps in labor, material and energy costs narrow between the world's two biggest vehicle markets, he said. "One of the big questions that manufacturers are trying to answer right now is whether growth can be sustained both in the U.S. and in China as these two key markets begin to look more alike," Hinrichs said. "What do we need to change if the U.S. and China are going to avoid repeating the sins of previous growth cycles -- when overcapacity and the loss of cost competitiveness doomed the automotive industry to long down cycles?" Hinrichs also called on the United States to develop a coherent manufacturing policy. He also proposed tax reforms including reduced tax rates and a simplified tax code. "The U.S. corporate tax burden is among the highest in the world, which limits our competitiveness," he said. "A lower tax rate would help Ford invest in jobs at home, accelerate new technologies and deliver best-in-class vehicles." Hinrichs also called for an "integrated energy policy that addresses the need for supporting infrastructure, the development of new vehicle technologies and the production of traditional and alternative fuels." Gabe Nelson, Lindsay Chappell, David Phillips and Bloomberg contributed to this report.